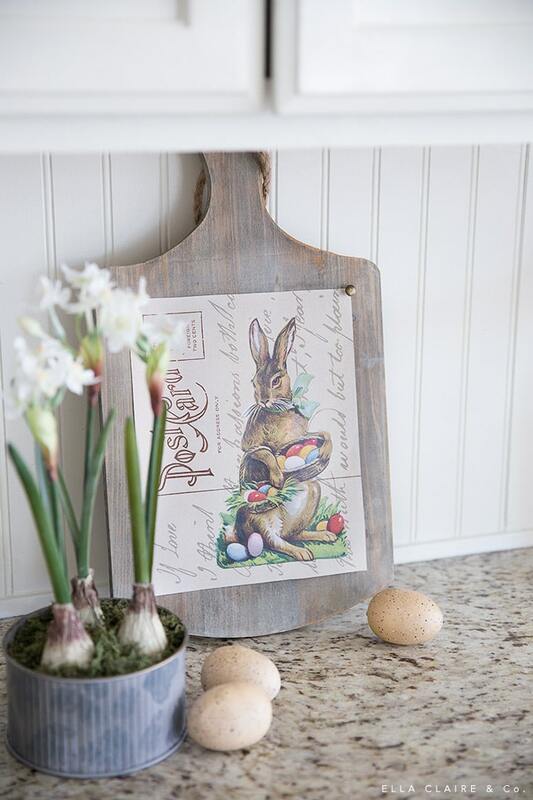 Easily decorate your home for Easter with this free printable vintage Easter bunny postcard art- a beautiful and inexpensive way to add vintage farmhouse charm and decorate for the holiday. 25+ free spring printables that are perfect for the season! I am having trouble locating my Easter decorations. For some reason some things aren’t in my ‘Easter decor’ box and I can’t, for the life of me, remember why they wouldn’t be in there. I’m not even sure what happened- did I donate them? Who knows. In the meantime, I made this free printable 8×10 vintage postcard Easter bunny art for you (and me) to decorate for the holiday! There are also more than 25 free Spring Printables that I am sharing at the end of this post, which I will be definitely be needing now! 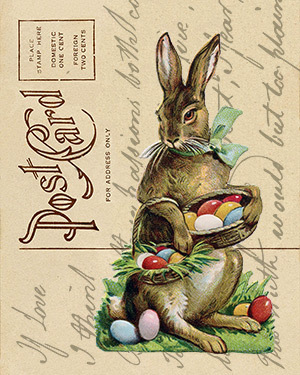 I loved this sweet vintage Easter bunny and decided to layer her on top of a couple of vintage postcard images. 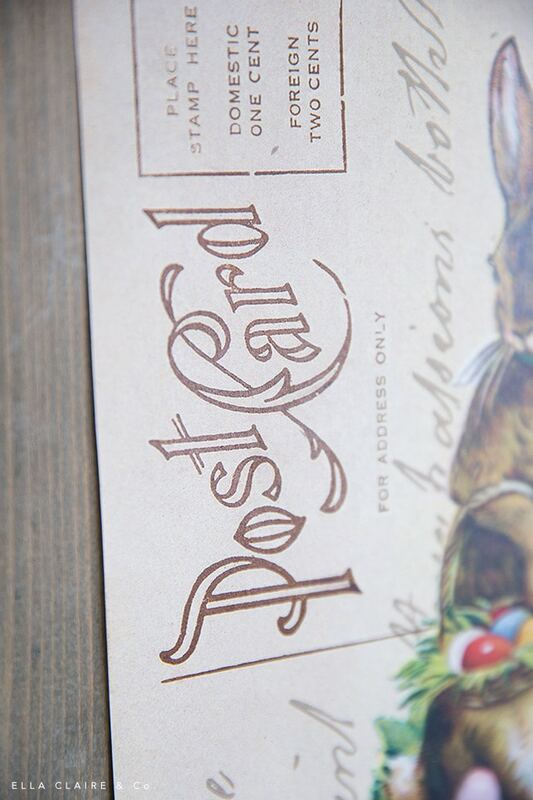 I think the “Post Card” typography is beautiful too; It is so pretty and feminine. Frame- this one is probably a no-brainer, but I always have a couple of frames on hand to switch out my artwork when needed. 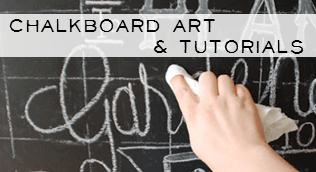 Clipboard- Just a plain, inexpensive clipboard is a cute and informal way to display artwork- and bonus, it is easy to change out! Breadboard- I used a faux breadboard with a cute shape I found at a local craft store for this one, but you could do this with any breadboard. 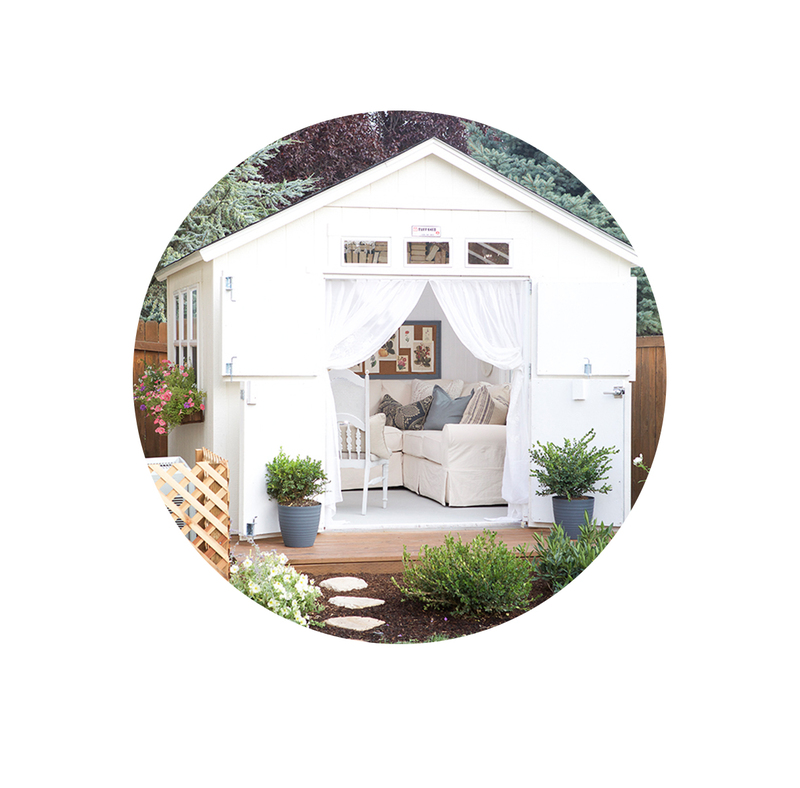 I used cute antique brass thumbtacks (found here) for even more charm. Printables are so fun to use displayed in the ways I mentioned above, but they are also great for adding charm to your Easter table, hanging on a magnetic surface or bulletin board, wrapping a gift, giving to a neighbor or friend with a treat or loaf of bread, or decorating any area of your home. This vignette was an easy one to throw together by just adding some faux bulbs and speckled eggs. 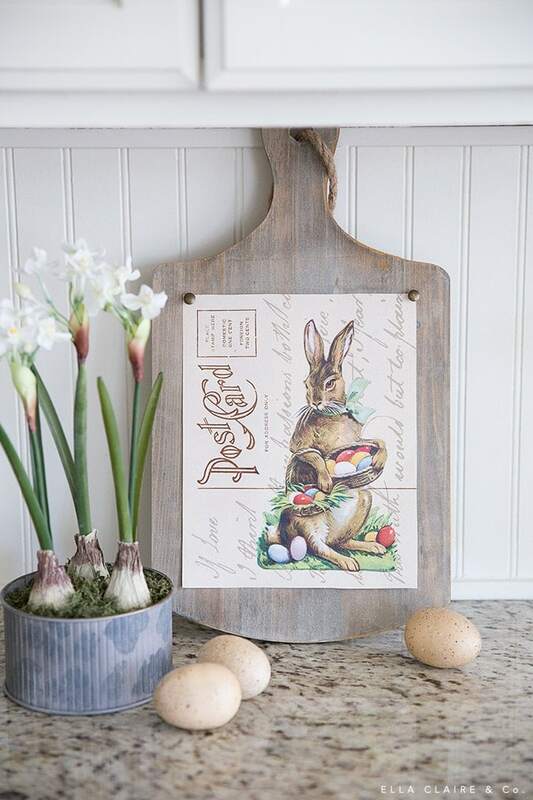 This Easter art print can be printed on your home printer or you can save it to a thumb drive and take it down to an office supply store or copy place (download below). I opted to do the former on a self serve color copy machine at a print store. It only cost about 60 cents and the quality was better and more even than I could have gotten on our home printer. If I had been short on time though, I would have just done it at home. Either way, I hope you love your print! One quick note- There is a white border around the print that should to be cut off before displaying. Just click on this print to download, or click HERE. Here are more than 25 more beautiful free Spring printables for you! 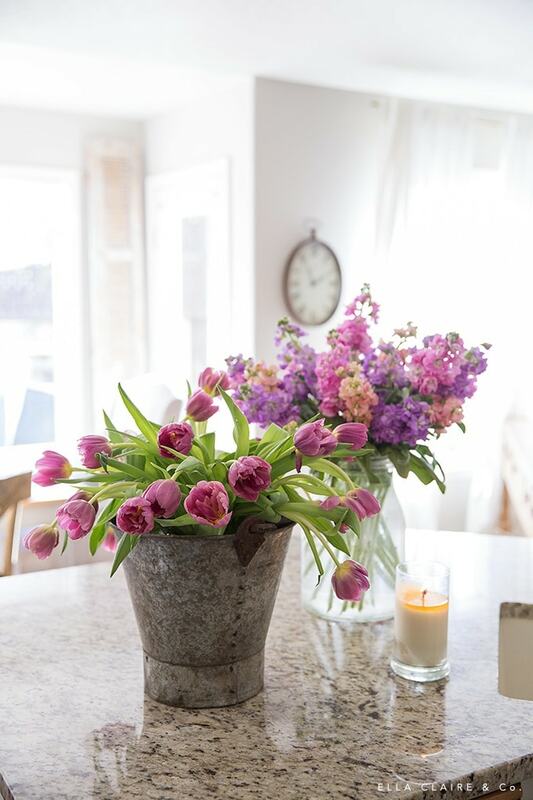 You will love tucking some of these here and there in your home this season! This is so adorable, Kristin! Thanks so much for organizing another great tour! So cute! I love vintage prints – especially ones with some type of script on them! 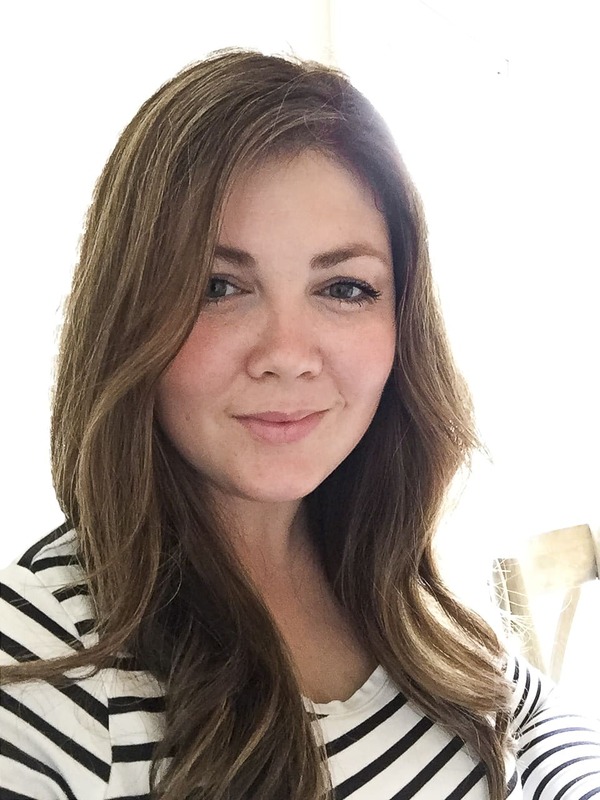 Thanks for organizing today’s event, Kristen. I love this print and the vintage bunny! Super cute. Happy Spring! 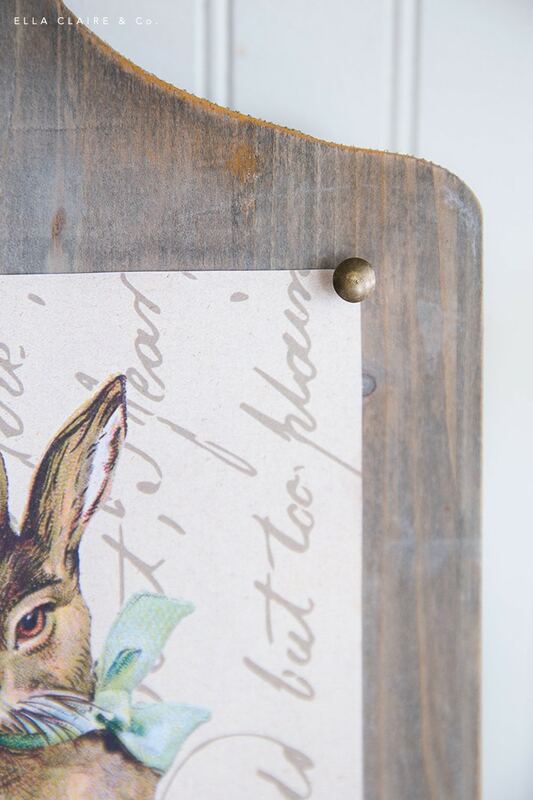 I love the vintage feel of the print and what a cute bunny! Happy Easter!